Each week I set out to find one stock to write about that I think is ready for a major move to the upside. To accomplish this, I start with a set of stocks that meet certain fundamental criteria. 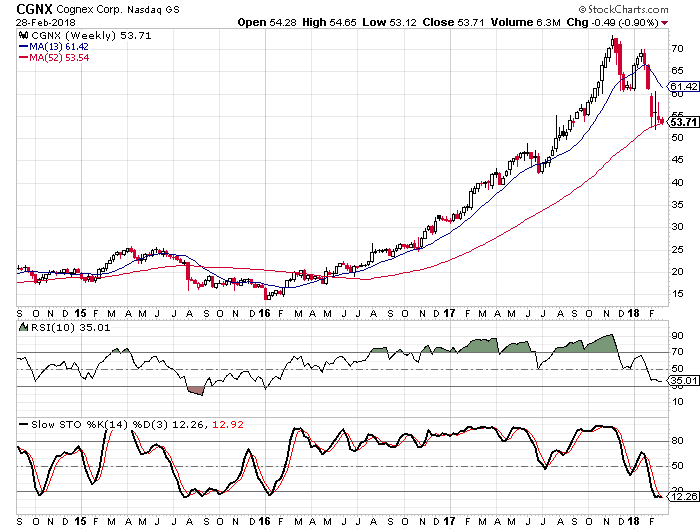 Once I have these stocks isolated, I look at the technical analysis for a company that isn’t overbought, perhaps has had a slight pullback but is still in an uptrend, and looks as though it is ready to resume that uptrend or reverse from the pullback. For the fundamental criteria, I use Investor’s Business Daily and the EPS rank and the SMR rating. I look for companies that rank in the top 20% of the EPS rank category, so a rank of 80 or higher is necessary. The SMR rating is a collective grade for Sales Growth, Profit Margin, and Return on Equity. I only look at stocks with an A rating in this category. Breaking the stocks down like this narrows thousands of possibilities to what usually amounts to 150 to 250 stocks. Heading in to March, I went through the universe of stocks and found 172 stocks that met my fundamental criteria and had average trading volume of at least 5ooK per day. I don’t want to write about a stock that trades 50,000 shares a day and then have readers trying to get in on a thinly traded stock. 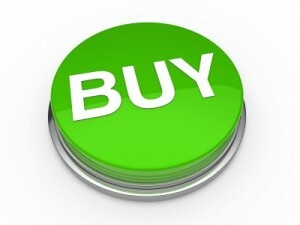 After paring it down to 172, these are the seven stocks that I think should be targeted as buys in March. There are various reasons for liking them- trendlines, trend channels, oversold, etc., but for one reason or another, these seven stood out to me for their potential gains over the coming month. 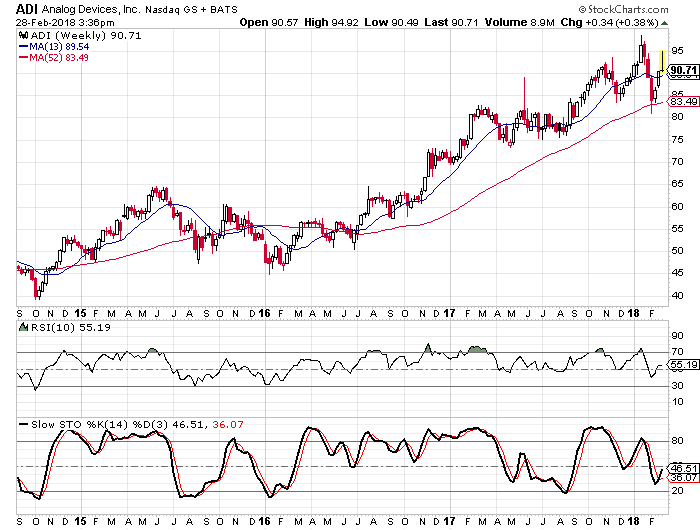 Analog Devices Inc. (Nasdaq: ADI) – ADI designs, manufactures, and markets a portfolio of solutions that leverage analog, digital, and mixed-signal processing technology. The company’s products include integrated circuits, software, algorithms, and subsystems. ADI has clients in various sectors that include industrial, automotive, consumer and communications companies. The company sells its products through a direct sales force as well as third-party distributors, and independent sales reps. ADI’s products are sold in North and South America, Europe and Asia. The company is headquartered in Norwood, Massachusetts and was founded in 1965. 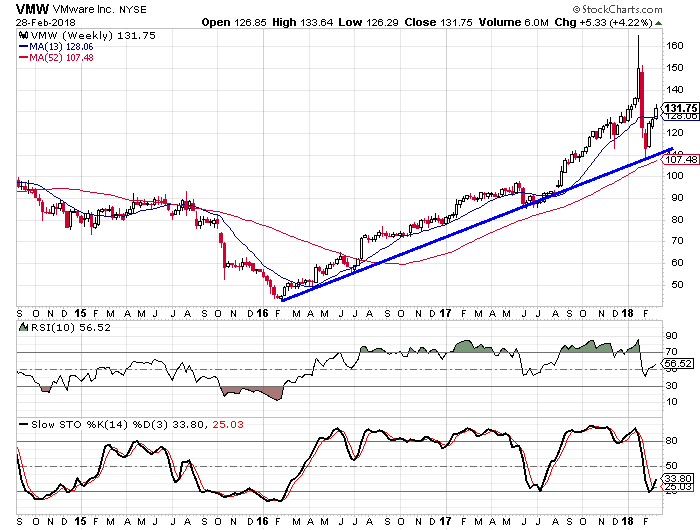 We see on the chart that ADI has been trending higher since the beginning of 2016 and hasn’t closed a week below its 52-week moving average since June of that year. The recent pullback did see the stock dip below the trendline, but rallied to close above it. The weekly stochastic readings made a bullish crossover in the last few weeks and that is encouraging going forward. While the oscillators didn’t drop down to oversold territory on the recent pullback, they did move below the 50 level and that has been rare in the past three years. Arista Networks, Inc. (NYSE: ANET) – ANET provides cloud networking solutions to customers all over the world. The company’s cloud networking solutions include extensible operating systems, a set of network applications, and gigabit Ethernet switching and routing platforms. The company serves clients in a number of industries, including internet companies, service providers, financial services, government agencies, and media and entertainment companies. The company was founded in 2004 and is headquartered in Santa Clara, California. ANET’s stock has been on a meteoric rise since early ’16, jumping from under $60 a share to a recent high over $300. 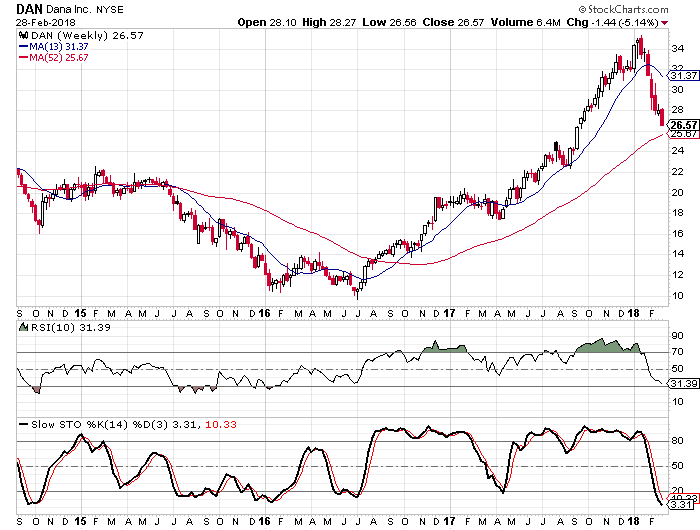 The recent pick up in volatility for the overall market caused the weekly stochastic readings for ANET to drip below the 50 level for the first time since July ’16 and then the readings made a bullish crossover. The stock has not been below its 52-week moving average since then. The lows over the last eight months have created a trendline and the stock hit the trendline last week. I look for the upward trend to resume now. Cognex Corp. (Nasdaq: CGNX) – CGNX provides machine vision products that allow manufacturing tasks to be automated as they capture and analyze visual information. The company’s products include VisionPro, a software suite that provides various vision tools for programming; displacement sensors with vision software for use in 3D application; In-Sight vision systems that perform various vision tasks, including part location, identification, measurement, assembly verification, and robotic guidance; In-Sight vision sensors; ID products, including DataMan barcode readers and barcode verifiers. The company sells its products worldwide and is headquartered in Natick, Massachusetts. CGNX was founded in 1981. 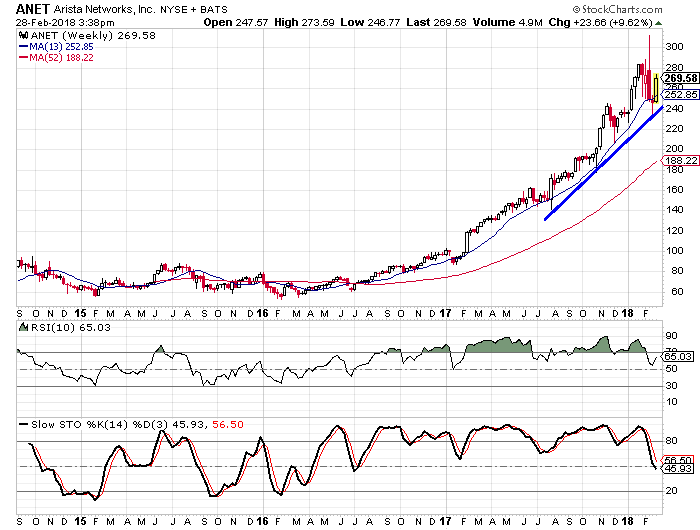 Like many of the other companies on this month’s list, CGNX pulled back to its 52-week moving average as a result of the recent pullback in the overall market. This is the first time since June of ’16 that the stock has been anywhere near the 52-week and it is the first time since January ’16 that the weekly stochastic readings have been in oversold territory. The readings made a bullish crossover that month and then the stock rallied from under $20 to $45 before the indicator dipped back down below the 50 level. The stochastic readings look like they will make another bullish crossover in the next week or two and then we could see another big rally. Dana Incorporated (NYSE: DAN) – DAN provides drive and motion products, sealing solutions, thermal-management technologies, and fluid-power products to vehicle and engine manufacturers in North America, Europe, South America, and Asia. The company is divided in to four segments: Light Vehicle Driveline Technologies, Commercial Vehicle Driveline Technologies, Off-Highway Driveline Technologies, and Power Technologies. The company is headquartered right outside Toledo in Maumee, Ohio. It was founded in 1904. 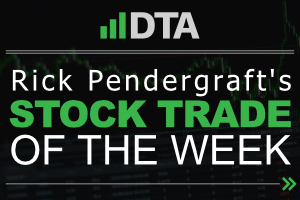 DAN was one of several auto parts manufacturers that were under consideration this month as the industry has some of the best fundamentals of all of the sectors. I chose DAN because I felt the chart for DAN was a little better than some of the others. We see that the oscillators are at their lowest levels in several years, but the stock has remained above its 52-week moving average. As long as the stock remains above the moving average, it will appear as if the long-term upward trend is in place. The last time we saw the stock anywhere near the 52-week and with the oscillators anywhere near the current levels was last April. 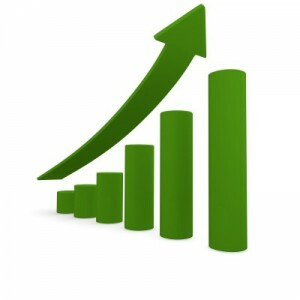 The stock doubled in price over the next nine months. Illinois Tool Works, Inc. (NYSE: ITW) – ITW manufactures and sells industrial products and equipment worldwide through its seven segments: Automotive OEM; Food Equipment; Test & Measurement and Electronics; Welding; Polymers & Fluids; Construction Products; and Specialty Products. The company distributes its products directly to industrial manufacturers, as well as through independent distributors. Like Dana, ITW has been around a long time. It was founded in 1912 and is headquartered outside of Chicago in Glenview, Illinois. 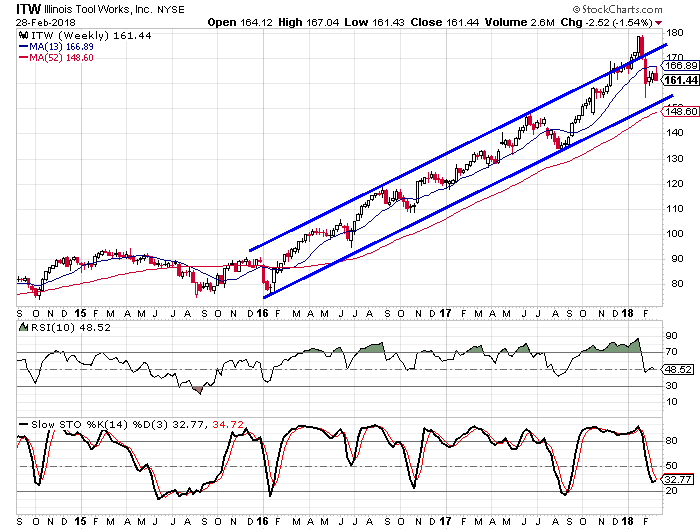 After seeing quite a few trend channels in last month’s list of stocks to target, we finally get a look at a channel this month thanks to ITW. The channel formed at the end of 2015 and early ’16. 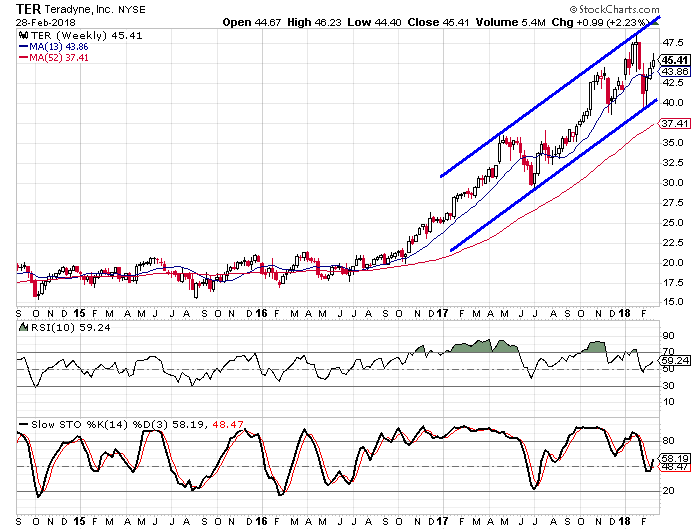 While the stock isn’t down by the lower rail, the channel is tight enough that I think we are looking at a good buying opportunity right now. The oscillators are below the 50 level for the first time since last August when ITW was on its lower rail. The stock rallied from $135 to $180 after it hit that rail. 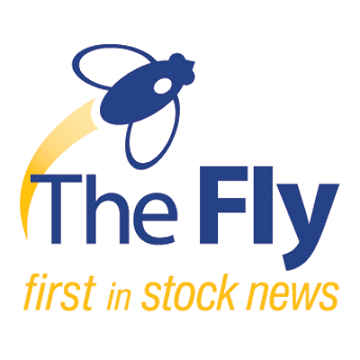 Teradyne, Inc. (NYSE: TER) – TER is the third company on this month’s list that is headquartered in Massachusetts. It is in North Reading and it was founded in 1960. The company designs, develops, manufactures, and sells automatic test equipment for different types of technology. The company’s products test semiconductors, memory devices, circuit boards, and wireless devices. They work with companies in the defense and aerospace industry, computers, smart phones, and robotics. Like ITW, TER has been trading in a trend channel, but its channel doesn’t go back as far as ITW’s. The recent low confirmed the trend channel with the highs confirming it. I didn’t draw a regression line for the last 15 months, but you can almost visualize it cutting right through the middle of the channel. The recent dip brought the oscillators down below the 50 level for only the second time in the last year and a half. The low last July served as a good buying point as the stock gained over 60% from the low to the high. VMware (NYSE: VMW) – VMW provides virtualization and cloud infrastructure solutions to clients in the United States and internationally. The company is a subsidiary of Dell Technologies Inc. Its virtualization infrastructure solutions include a suite of products and services designed to deliver a software-defined data center (SDDC), run on industry-standard desktop computers, servers, and mobile devices; and supports a range of operating system and application environments, as well as networking and storage infrastructures. VMW is headquartered in Palo Alto, California and was founded in 1998. We see on the chart that a trendline has formed that connects the weekly closing lows for the past few years. 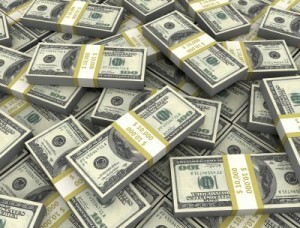 The stock dropped down to the trendline before bouncing back over the last three weeks. We see that the stochastic readings just made a bullish crossover after flirting with oversold territory. The stock did the same thing last summer and then rallied from around $90 to over $160. I am looking for a similar move this time around.